PowerShell ISE is included with Windows by default, reducing the amount of software I have to deal with. PowerGUI is bulky and getting long in the tooth. I don’t use the Administrative Console or PowerPack addons to write scripts. Iterative updates to PowerShell ISE are focused on new features provided with PowerShell 5.0 and Desired State Configuration (DSC). I get that everyone has their personal preferences on tools. If you like PowerGUI, stick with it. If you’re curious about PowerShell ISE, I’ll go deeper into how I use it below. The first thing I suggest doing is setting up the color theme for productive coding. The default theme is “Dark Console, Light Editor” which is pleasant enough for starting off, but I prefer the “Dark Console, Dark Editor” theme to give code greater contrast and also emulate the natural PowerShell CLI. To make this change, navigate to Tools > Options > Colors and Fonts > Manage Themes. This is also where you can tweak other colors if desired, but the font coloring is pretty decent out of the box. While you’re here, you can also toggle over to the General Settings tab to adjust the AutoSave interval. It’s set to 2 minutes by default, which I find to be enough to keep me honest, but you can adjust it up or down to suit your taste. If you want to get fancier, I’ve actually taken a shine to the Oblivion theme on the Eclipse Color Themes website. 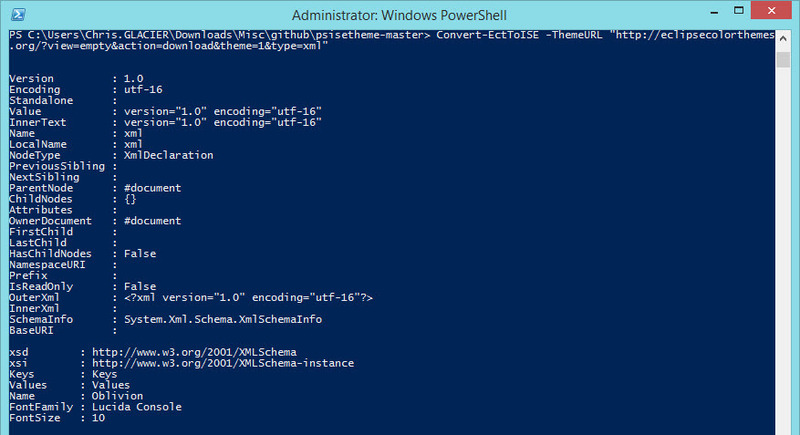 While not usable in its native form, the XML file can be converted to a PowerShell ISE theme using a converter provided by akawhoami on GitHub. If you’re going to present code on a projector screen, I’d go back to a light background with dark text. Because most projector screens are a white screen, it’s not possible to make the background color truly dark – the projector simply projects “nothing” for black and you end up getting a funky washed out look. Set the console location to my Dropbox\Code folder, because that’s where I work on PowerShell code in most cases. Test to see if the $psISE variable exists, meaning that I’m launching the ISE. If it does, I start ISESteroids and pump myself up with a little table throwing action. If I’m in the console, the logic test fails and nothing else happens. The PowerShell console is simpler. To do so, find the shortcut for PowerShell or PowerShell ISE, open the Properties > Shortcut > Advanced > and check the Run as administrator box. At this point I have what I consider to be a usable copy of PowerShell ISE at my disposal. While it may look like a lot has happened, it isn’t that much and only happens on a new system. I have a master copy of the profile, colors, and portable modules that I clone to my workstations via Dropbox. I’m also a huge fan of ISESteroids, which I plan to go over in greater depth in the future. Thanks for this simple yet awesome tutorial! I currently have a limited skill set with PowerShell/CLI but I am forcing myself to use it more each day for the silly things like checkbox settings or rebooting a VM. So as I become more familiar with the commands & functions I tend to get lost and forget the simple things like making my ISE workspace look & feel comfy, like you have shown here. Awesome stuff. The last picture (red 1,2,3,4). I’d question why you are writing PowerShell code from 100 servers, as you only have to do the Run as Administrator trick on your client machine.